With Fox Racing’s R3 Motocross Roost Deflector, you know that you are getting the best-in-class coverage and updated chassis style there is to offer. The Fox Racing R3 Motocross Roost Deflector delivers ample roost coverage to everyone who rides. The R3 features a body hugging, race-form fit as well as high-end features such a chrome shoulders and stylish graphics. So make the Fox Racing R3 Motocross Roost Deflector your next choice for protection. With its best-in-class coverage and updated chassis style, the R3 deflector delivers ample roost coverage to everyone who rides. The R3 roost deflector features body hugging, race-form fit as well as high-end features such a chrome shoulders and stylish graphics. Polycarbonate chest, back and shoulder construction. Only used twice but it’s comfortable enough and my son has no complaints wearing it. We removed the arm protection as it didn't fit well. The other parts of it fit great, We have 2 and no one complains how it fits. Worn under jersey and over a light shirt. Fit and finish is good. No issues. Sizing is good. Kid likes the protection. This came quickly and fits perfect. Great quality and price. Sizing was correct, comfortable, easy on off. This roost fits very well. I am 5'10 and 210 lbs and the XL size fits perfectly. It is very comfortable and has held up very in a few crashed that I have had in the rocks. I would fully recommend this roost deflector. I bought 2 of these, one for each of my kids who are now out of the kids sizes and into adult sizes. Let's hope this is the last one I have to buy! They really like these and said they are very comfortable. They love the way the look as well. Little Big but the smallest size they had! 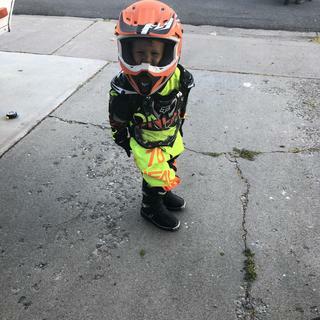 We wanted a chest protector for our 4 year old the smallest size they had was a small. Its a little big which makes the arm protectors not as comfortable, but he can still ride and steer without any trouble. That is my only reason for giving it a 3 on comfort. It will grow with him and should last a couple years. worth the money! Just what I was looking for. Sturdy and comfortable fit. My kid loves it. Pretty good quality. Fits right too. It’s nice to get what you expect out of a product when you order it online. Very happy with this. Nice fit. Came before I thought it would. This fit me very well and it's very comfortable to wear. Easy on and easy off. Fits great. I'm 6'4" and the large was all I could get and it was just fine. Didn't even know I had it on the entire time riding. I felt well protected. I searched the web and RM's price was right in line. It's nice to not only "feel" protected but to actually "be" protected. Plus it looks great! Good value for the money compared to other similar products on the market. This product fits exactly as labeled. I'm 6'2"/200 and it fits great. Not a big fan of the arm guards as they tend to cut off circulation. The hard plastic provides excellent roost protection. My 5 yr old will put this on himself and keep it on the entire time at the track. So it has to be comfortable. I would definitely recommend this product. Bought for my 11yr old. 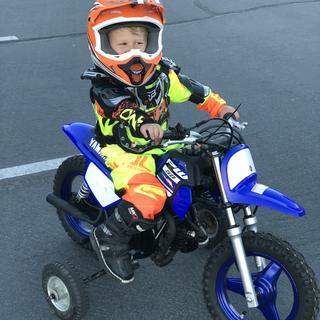 First one but it fits well and has already helped in a crash and boosted his confidence. I bought 3 of these for my boys. The range in age from 8 to 14. I stuck with the recommended sizing shown on the product page and everything fit great. The shoulder guards are removable with a button snap. Range of motion is not affected at all with these units. Love it 6-1 and 215lbs fits great and stays on place!!! Fire perfect and looks great! I bought this for my son who is 5'0" and about 140 lbs. We bought the 110-165 lbs. 5'2"-5'11" size and it fits good with room to grow. Haven't tested it with a Leatt yet. This is my 2nd R32 clear deflector. My son bought the first one for me over 10 years ago and it has really seen better days and has been crash tested more times than my wife's car with far less expense! They fit well and I really like the clear front and back panels as they don't not obstruct the graphics of my jerseys. I'm a big guy. 6;'8" and 280 lbs. This fits me as well as I could expect and a littler better! I dont feel constricted at all wearing this and I can even wear it under a jersey and it still fits great. Protection is nothing to joke about or skimp on. Worth every penny. Nice chest protector and good price. This is my fourth Fox unit and none have failed other than snaps on the shoulder cups. Looks great, can adjust to lengthen the front and back protector. Fits very nicely and for the price it is great. I bought a large and I am 6’ 1" 240 pounds and fits great. I would recommend it. Very good quality. Works very well and like how there's different colors. U can get in different sizes and tighten them also. There definitely worth getting so you don't have rocks and dirt flying up and hitting. It has worked very well for me. Also when your in trails helps when there's a lot of trees and thorns cause it won't hit your chest it hits your deflector. I would recommend this product to any rider. Good to be safe, this is the way to go. Bought this for my 9 year old son who is just getting into MX. He's had a few spills and has walked away unharmed, thanks in part to the chest protector. He's about 4'8" and weighs about 80lbs and this fits perfect and should allow for growth. For the price, you can't beat it. We are very happy with this purchase. Seems spendy for what you get, but they all are. Works good and looks good too. My son thinks it's cool so I'm happy. These chest protectors were purchased for my two young sons. Both have a tendency to end up on their skid lids. We ride a lot in the Mojave desert where there are a lot of rocks. Neither one have ever complained about being hurt by rocks that have hit them in the chest. They always put on their chest protectors without complaining. That more than I can say about their helmets. I would buy again. Fox has a great line of products! This is a great roost deflector and chest protector!! This one is best work on the outside! If you wear it on the inside you make look like a football player! If you are looking for the one to wear under a jersey you would most likely want the Fox proframe model! Great fit, and style. My son has been using for a year now and it has saved him many times. Hard falls in the gravel and rocks that he's done would have broken a bone for sure without this chest-back-shoulder-upper-arm proctor. Light weight and fits all three kids. We don't race only recreation but easy piece of mind without making them look like the kid from The Christmas Story. Good roost protector. Does its job and keeps you cool. This was a great purchase for use on the MX Track as well as in the woods. Any parent will vouch that extra protection is great wherever you can get it. This product is small enough that it doesn't affect the maneuverability of my boys on the bikes. Light and comfortable plenty of ventilation and protection. I think it's the best one I've owned. Sizing chart helped immensely, great chest protector. This roost deflector fits well and provides great protection from flying debris. Has plenty of ventilation holes so it is not too hot. Recommend for protection of your children. Save your chest and buy this! This bad boy fits great and has saved me many a time from having massive bruises from roosting. My son is 10 years old, 90 lbs but has fairly broad shoulders. I'm trying to make sure I pick the right size. What is the shoulder width for the 70-120 lb size? BEST ANSWER: The shoulder pads tip to tip are 14". Does this vest interfere with the leatt neck protection? BEST ANSWER: My son and I both wear Leatt GPX 5.5 with the Fox R3 and have no problems with fit or comfort. Very satisfied with both products. Hope this helps! Can you tell me what size chest protector, and how he wears the neck brace - over / under? I am getting back into riding, first time for my 10 yo, and I want to make sure I do it right. I have a non-negotiable 5.5 Jr Leatt, but am not sure how to fit it with the R3. My son is on the smaller side, and we have the small R3. Do you tuck the front under and leave the back out? Thanks! can this be worn under a jersey? Yes, if the jersey's a little loose fitting, no problem. That's how I wear it. Maybe if your jersey is big enough. It's good looking, wear it outside! Yes it can. I would wear a light shirt under it. Will this work with atlas air neck brace? BEST ANSWER: You shouldn't have any issues with the atlas neck brace. Can you get nameνmber on chest protector? BEST ANSWER: Unfortunately, we do not personalize chest protectors but we do have kits you can purchase and put numbers on them at home. Is there a size chart or fitment guide available? BEST ANSWER: It looks like this roost deflector is sized by weight and height. If you select the color on the item you will be able to look at the size drop down menu where it shows the weights and heights they have for this roost deflector.